Can the dichotomy between obsessive tooling and strong design agenda be overcome? Can innovative software like Grasshopper be the ideal platform to marry computation, creativity, and ecologic thinking? 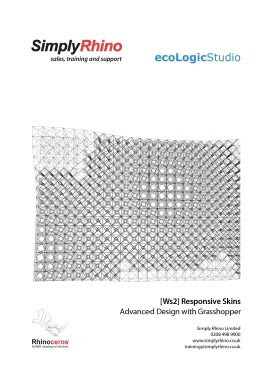 This 4-day intensive workshop will engage these questions introducing a novel parametric modeling technique which will allow Grasshopper to connect to the web and be fed by live environmental data streams. Architects, landscape architects, urban designers, and students alike will find in the workshops a unique chance to improve their design skills while confronting themselves with the most debated advanced design subjects. This workshop staff is from the experimental design and consultancy practice ecoLogicStudio. A final event-discussion includes expert guests from the fields of architecture, landscape, and urban design. Program details. See more details and RSVP on the Grasshopper web site or at Simply Rhino UK web site.